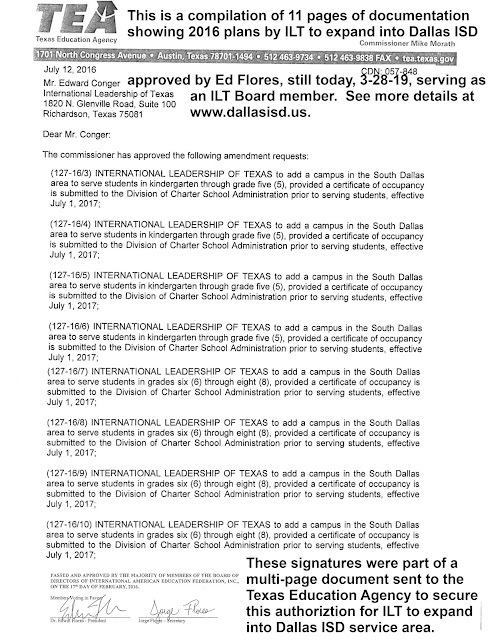 Six years ago, 4-25-2013, the complaint copied below was filed with the Dallas ISD Board. It was never resolved. Now Dallas ISD can find no record of it. 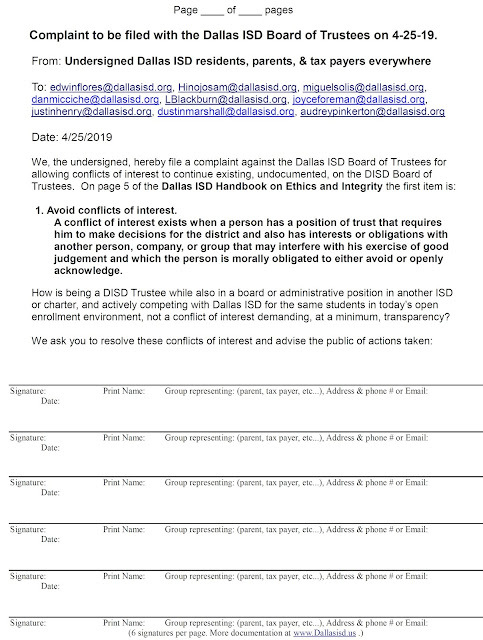 Sadly such conflict of interest situations continue to exist unacknowledged on the Dallas ISD Board. 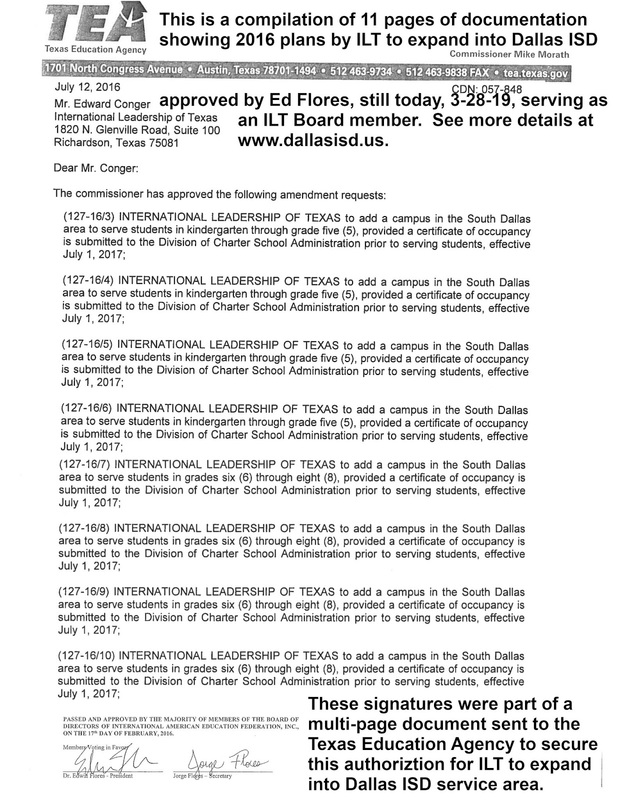 Such a conflict of interest situation probably allowed information to be collected by the current DISD Board President, on the DISD board since 2015, to encourage him as Board President of International Leadership of Texas Charter Schools (ILT) in 2016, to lead the application process for ILT to develop 8 schools in South Dallas. A 102 page document shows his ILT work in 2016. He continues serving on the ILT Board today while also serving as Dallas ISD Board President. A new complaint is in process using the form below. 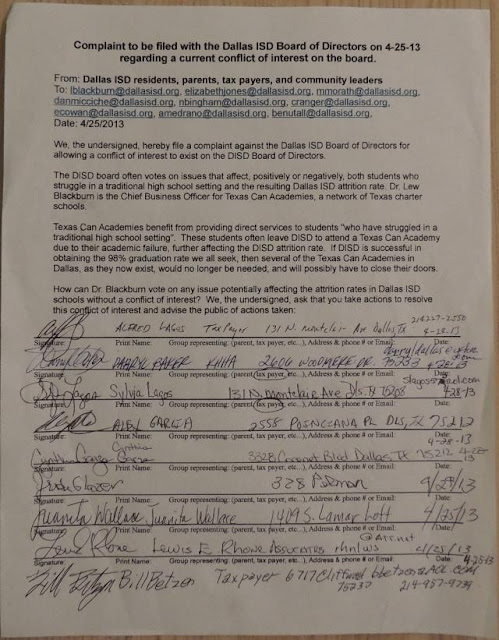 The first 5 pages fully signed with 30 signatures on the same form dated 3-28-19, was emailed to all DISD Board members on 3-29-19. 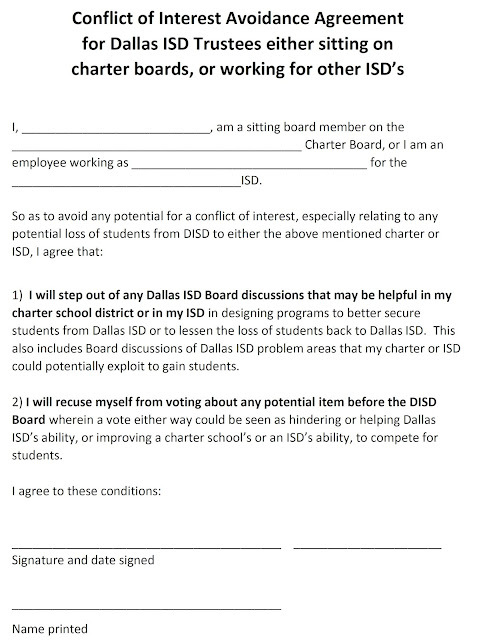 The new form below will be filed at the April 25, 2019 Board Meeting, the exact 6-year anniversary of the last such complaint, above, that somehow DISD appears to have lost. 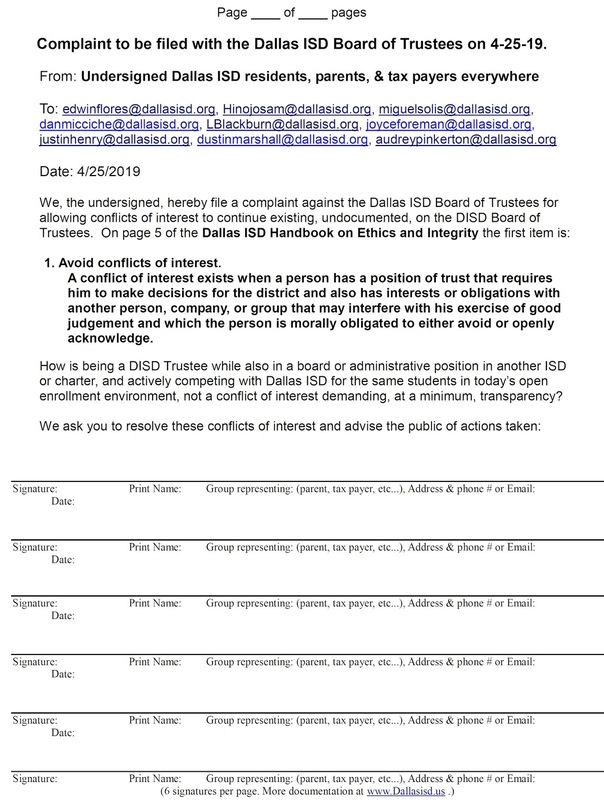 The DISD Trustee conflict of interest situations demand a public resolution. Currently the board member, Dr. Blackburn, who was the subject of the 4-25-13 complaint copied above, is not going for re-election in May. However the Board President, Dr. Edwin Flores, and a trustee candidate now running for office, are both either continuing in conflict of interest situations or are planning to serve, if elected trustee, in a conflict of interest situation. The conflict would be serving as a DISD Trustee while also working full time as "Chief of Research, Evaluation and Design", a member of the administrative team in DeSoto ISD. DeSoto ISD actively competes with Dallas ISD for students. Repeat, both of these conflict situations involve school systems that actively compete in today's open enrollment environment for students with Dallas ISD. Here is the 4-25-19 dated form to continue to sign for the April Board meeting. The depth of public concern must be shown. Anyone who agrees with these issues can print out the form above and collect signatures for the 4-25-19 meeting. You are encouraged to turn those in you collect yourself at that 4-25-19 meeting, or at the earlier Board Briefing on 4-11-19, if you want. The more who voice their concerns the better! I will collect the ones not so submitted so they can be included in the complaints filed on 4-25-19. You can either use the above copy to make the petitions you will collect signatures on, or you can email me, bbetzen@aol.com, and I will send you a pdf copy for printing. To see all 102 pages summarized into the above page, please email bbetzen@aol.com. Carefully read the above form, The impossibility of allowing such conflicts to continue is made very clear. Why have they been allowed to continue on the Dallas ISD Board? 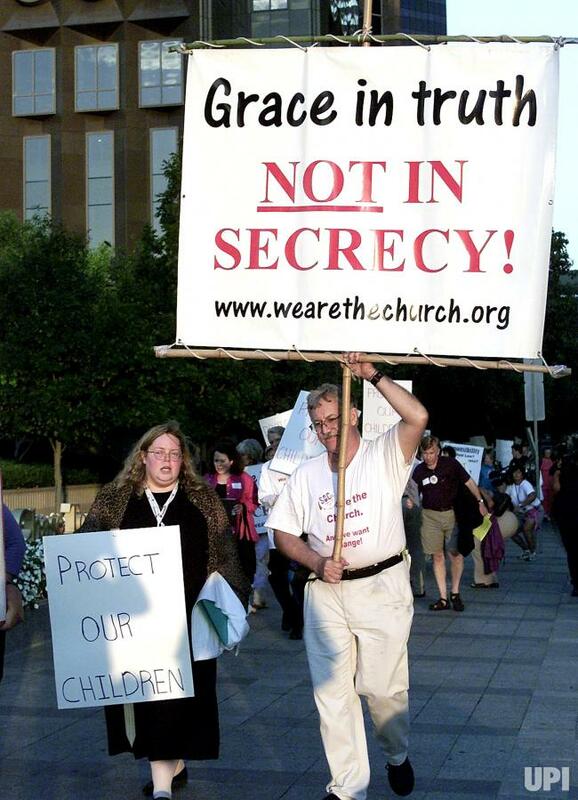 "Grace in Truth, Not in Secrecy!" - The universal people's demonstration sign. However, this is a universal message against secrecy that applies to many other situations. Now it is being applied to the urgent need that the secrecy of the Mueller Report end. It must be made public! Join in the fight! 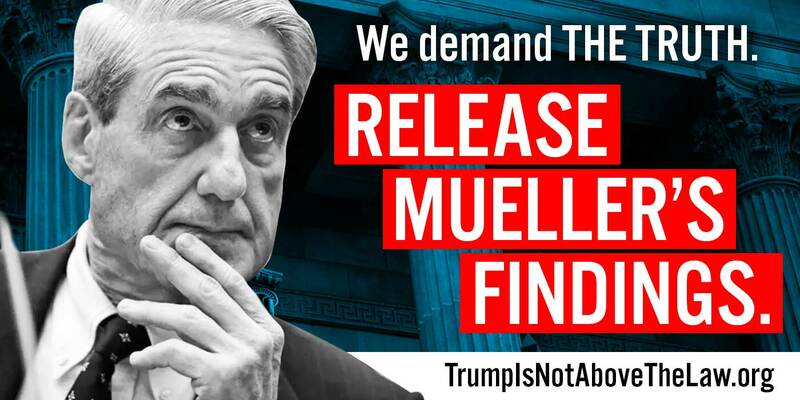 https://act.moveon.org/event/mueller-firing-rapid-response-events/? 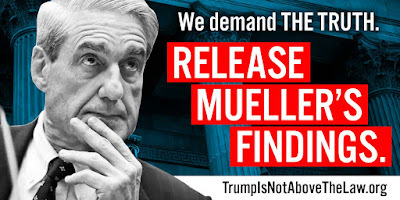 To see the most recent news simply google "make mueller report public." Questions given Miguel Solis since 2013 & unanswered. Where is transparency now? In 11-6-2013 these questions, linked here, were presented to Miguel Solis and he repeatedly refused to respond to them beyond no response. The list of questions is shortened and updated below. In November 2013 many were urging DISD leadership to pay attention to data slowly being exposed regarding the results of Mike Miles' management in both Harrison District Two in Colorado and here in DISD. DISD was having similar teacher dissatisfaction and student loss results as his management of Harrison School District Two in Colorado Springs. In Harrison 1/3 of the senior class enrollment was lost the last 4 years before he came to Dallas. These appear to have been low struggling students and their loss appears to have been a driving factor in the college test score rise that made Miles attractive to some DISD Trustees! They apparently did not see the loss in senior enrollment. Miguel Solis speaks repeatedly while campaigning about his commitment to transparency. To support transparency the following questions were sent to Miguel Solis on 10-22-13 and never answered. His apparently blind support for Mike Miles led to Dallas ISD eventually having 43 failing schools in 2013/14, the second year of Mr. Miles' time with DISD. When these questions were first given to Mr. Solis, Dallas was half way to suffering the loss of 6,000 teachers during the 3 years of Mike Miles' time as superintendent. Answers to these questions are much more important now that Mr. Solis is running for Dallas Mayor. Will Mr. Solis ever achieve the transparency he often spoke about? 1) Before he was hired in Dallas ISD there is no evidence that Mr. Miles was asked about the 26% drop in high school enrollment during the 6 years he was superintendent over Harrison School District Two in Colorado Springs. (In November of 2013 the DISD Class of 2014 had 531 fewer seniors than the Class of 2013. Was the same loss about to happen in DISD? The whistle was blown about this loss as of November 2013 and apparently the loss stopped.) During a time when elementary enrollment rose over 20% in Harrison, indicating families were moving into this Colorado district Mr. Miles was superintendent over, a 26% loss of Harrison high school enrollment is an exceptionally dangerous sign. Does this loss bother you Mr. Solis? What does it mean to you? Can you secure, or did you ever receive an answer from Mr. Miles as to what happened in Harrison to cause this student loss? 2) The majority of the above mentioned Harrison loss was to seniors. The Harrison District senior class lost 33% of their enrollment during the 6 years Mike Miles was superintendent. In Dallas, during Mike Miles second year in DISD, the senior class had lost 531 students as of November compared to the previous year’s enrollment, a 6% loss. Does this loss bother you? 3) Mike Miles has alienated some of the most respected and accomplished leading education professionals in DISD. It has resulted in many of them leaving their critical leadership positions as reflected in this article: http://dallasmorningviewsblog.dallasnews.com/2013/08/three-of-our-four-annointed-super-principals-have-been-drummed-out-of-disd.html/ Does this leave you comfortable about his leadership style? 4) Mike Miles had monumental difficulty in hiring and keeping even the staff who worked closest to him in spite of the exceptionally high salaries he had given them: http://dallasmorningviewsblog.dallasnews.com/2013/05/when-will-disds-revolving-door-end.html/ . What is your opinion of that turnover? 5) In 2013, when reported at the end of July, DISD did not officially notify the board that, for the first time in DISD history, the proportion of DISD students taking college entrance exams went down. The percentage of DISD Minority students taking the ACT exam fell by over 23% while that percentage was virtually unchanged for the SAT exam. Does it bother you that Mike Miles did not point out these reductions in the student population tested to the Board? Does it bother you that instead, through reports given, he claimed very questionable and unjustifiable student progress with higher average grades reported for the ACT? As you well know this is easy to achieve by only giving the tests to the most highly motivated students who want to take the test. Do you agree that the Board should have been notified that the number of students taking these tests decreased by 23%? 6) Rewarding teachers financially for improving their students performance was something happening in DISD years before Mike Miles arrived. It was positive. I made thousands of more dollars as a teacher due to such bonuses. Mike Miles helped formalize such a system going to the extreme that virtually all increases came from Teacher Excellence Initiative (TEI) formulas. The increases were no longer bonuses. Now it has been shown that this has increased average salaries the most since 2015 for schools with the least poverty and the highest White student populations. Do those trends bother you? What corrections are needed? How will such trends help high poverty, minority students? You can see the data involved in these trends linked to the studies at https://billbetzen.blogspot.com/2019/02/higher-dallas-isd-teacher-salaries-are.html and at https://billbetzen.blogspot.com/2018/11/dallas-isd-teacher-excellence.html. The responses of Miguel Solis to these questions will be posted here if and when they are received. The link to this page and these questions was emailed this morning to the contact information at https://www.miguelformayor.com/ along with a request that Mr. Solis respond. Downtown Dallas has many locations reflecting both Dallas and Human History. It is a history that continues to expand as brutal public events, forgotten in history, and are now being acknowledged. This post is about 4 places downtown: developed, being developed, and yet to be developed. They are all within easy walking distance. They are numbered on the satellite view image below. There is no memorial to Jane Elkins anywhere, not even in the city where she died. One is needed to reflect her suffering and that of the many thousands sexually abused in slavery. The public needs to know the horror of slavery, the reason why Confederate statues to those who wanted to keep slavery had to be taken out of places of respect, but not out of our history. Museums must now struggle with how to most accurately tell this history. Location #2 is where the July 1860 lynching on the Trinity River of three black men, Patrick Jennings, Samuel Smith, and a man known only as Old Cato, who were accused of burning down the young city on July 8, 1860. Fortunately this area, that was along the banks of the Trinity in 1860, was named Martyr's Park in 1991 according to the Dallas Morning News story that you can see by clicking here. Still no memorial has been created that can be seen and read by the public to know this history. 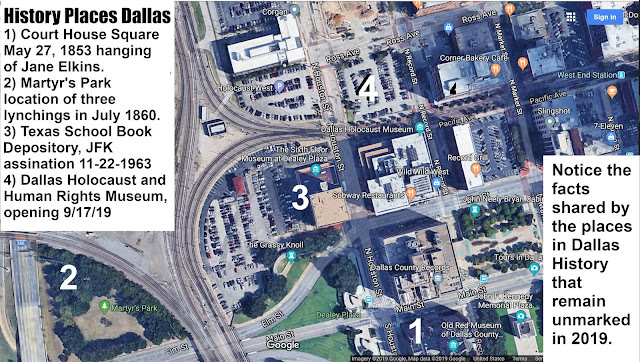 Click here to see one idea for a memorial that could trace Black History in Dallas from the Civil Rights Act championed by JFK, who was also killed near both locations 1 and 2, and back to the 1853 and 1860 deaths that happened nearby. They were all martyrs in the struggle for justice. Location #3 is the most completely developed and recorded history. It is the history surrounding the 1963 assassination of President John F. Kennedy that happened on Elm Street in front of the then Texas School Book Depository, now Dallas County Offices. See number 3 below. Location # 4 below is the Dallas Holocaust and Human Rights Museum that is now under construction and will be opened 9-17-2019. It is a powerful addition to Dallas and hopefully will reflect on all Human Rights History, including that history reflected at locations 1 and 2 on this list, as yet still unreflected in the publicly acknowledged history in Dallas with public monuments. The lack of public monuments reflecting the horror of slavery reflected in number 1 and 2 above is the history "Lost Cause" mythology tried to hide. The Confederate Statues are slowly being moved into storage pending proper display in museums. Dallas must struggle to acknowledge and show respect to those who died due to the abuse of slavery, the slavery that led to the most disastrous war in U.S. History, the Civil War. We must prepare to accept a much more accurate and complete history. Those of us who do not already share the DNA of U.S. slaves will someday have descendents and/or relatives who will. This is the history of all of us. 2017 TEA Snapshot published a year late! I noticed today for the first time that the 2017 TEA Snapshot has been published. It is a year late!